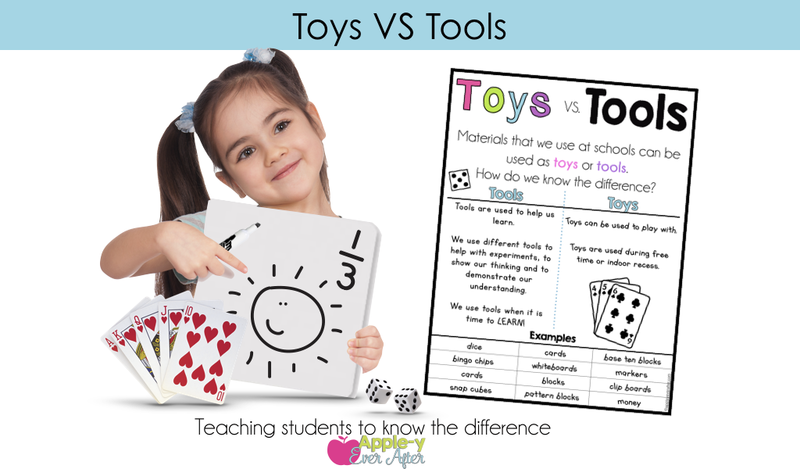 Teaching the Difference between Toys and Tools - Apple-y Ever After! So, here I go again. I give students a mini whiteboard and a marker and then I turn around to draw something on my whiteboard only to turn back around and see that ½ of my students are drawing pictures of cats wearing funny hats and actually not paying any attention to what I'm doing or saying. I have finally discovered a way to verbalize my expectations of the wonderful tools that I in my classroom! At the beginning of the year I sit my students down and go over the expectations that I have when we use things like mini whiteboards, dice or clipboards. I begin by holding up several of the manipulatives that I use in my day to day teaching. Me: Boys and girls, what is this? Every student shouting out: That is a whiteboard marker!!! Me: That's right! What do I use this whiteboard marker for? Student: To write on the whiteboard. Me: Why would I need to write on the whiteboard? Student: To show us something or to teach us something. Me: Do you think Mr. Principal would be happy if he came in and saw me drawing random pictures of silly things when I'm supposed to be teaching you? Me: Well then how would he feel? Me: Exactly! But what if I was using this whiteboard and marker to teach you a new game. It's a really fun game and everyone is enjoying it. Do you think that Mr. Principal would be upset if he walked in and saw that? Student: Because we are learning! 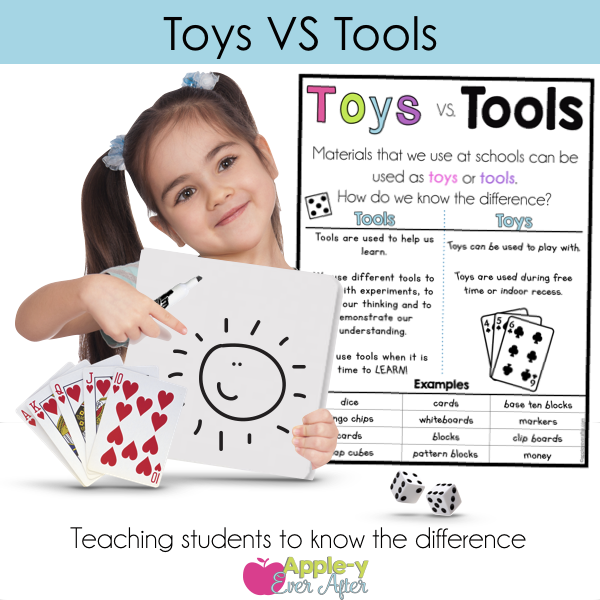 Having this conversation with your students is a great jumping off point into the toys VS tools discussion. Me: The things in our classroom can be used in many ways! For example, what do we use dice for? Me: What kind of games? What games do you know how to play with dice? Students: List several games (some school games, some purchased games). Me: That's a lot of games, but guess what? I plan on teaching you some new games this year. 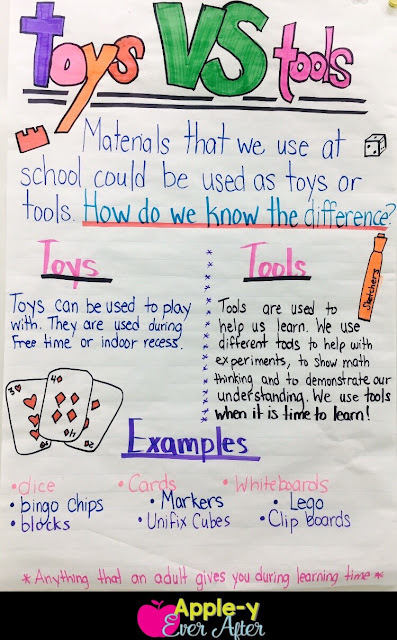 In order for me to do that, I need to make sure that we know how to use the materials in our classroom because things like dice or mini whiteboards can be used in so many ways. When we use these things for learning, we are using them as TOOLS. When we use these things during free time, we are using them as TOYS. So, how do we know the difference? I created an anchor chart with my students to set my expectations right away. This is what my anchor chart looked like. I admit that it isn't very pretty, but it did the job and my students got the point. I will admit that there are still days when those funny cats in hats pop up when I am trying to teach, however all I need to do is say "I love how [name] is using their whiteboard as a tool for learning!" and all the funny hats with cats underneath disappear before my eyes. I have also created a small poster that you can use in your classroom if you like. The poster looks like this and can be downloaded here!